Not a lot to say about this week. Unfortunately. I went to the RG Active Openwater Swim at Hampstead Heath on Tuesday. I was really late to this as I left work late. My Garmin didn't manage to find any satellites so I had to recreate the swim using Endomondo when I got home. In total I swam nearly half a mile. I don't know if my wetsuit has got bigger or I have got smaller but I am starting to notice that my wetsuit is developing pockets which fill with water particularly around my arms. This feels a little fresh when swimming in open water. It also makes swimming more difficult due to the extra weight. I didn't manage to do any training on Wednesday as yet again I was late leaving work and I couldn't muster the enthusiasm to go to the gym. On Thursday I was going to go for my first run since injury but a combination of circumstances led to this not happening, Firstly I forgot my achilles support. Then I realise dI'd also forgotten my headphones and I can't abide running without music. I know I will have to do it during the triathlons but that is different as there will be other people and the crowd. Then as I was debating going for the run without the achilles support, the heavens opened. This made my mind up, there was no way I was running now. Thanks to Twitter I was persuaded to go the RG Active swim at Hampton Pool. For those not in the know. Hampton Pool is a 36m long open water pool where the water is constantly heated. I was so glad I went to this swimming session. I had a really good time. My Garmin got a bit confused with all the different strokes and drills we did. At the end it said I had swum a total os 2772m. According to my maths this was out by 17 lengths so in total I swam 2160m. Not bad for an hour;s work with rest periods. This is the furthest I have swum since I started on my journey. It was really nice to meet some new people who also truing with Rg Active. Next time I think I will take my wetsuit as "apparently" it is easier to swim when wearing a wetsuit. When I got back to the hotel I was in a word KNACKERED. Now onto my new obsession. Barefoot running. Since reading "Born to Run by Chris McDougall", my every waking (non working) moment seems to be spent researching barefoot running and the benefits that it can lead to. I am really intrigued due to its apparent health benefits. I say health benefits as no injuries is healthier than constantly being injured. I've been researching brands, how to transition and lots of other things about barefoot running. I had managed to narrow the brand of shoe down to two, either a Newton or a Merrell. 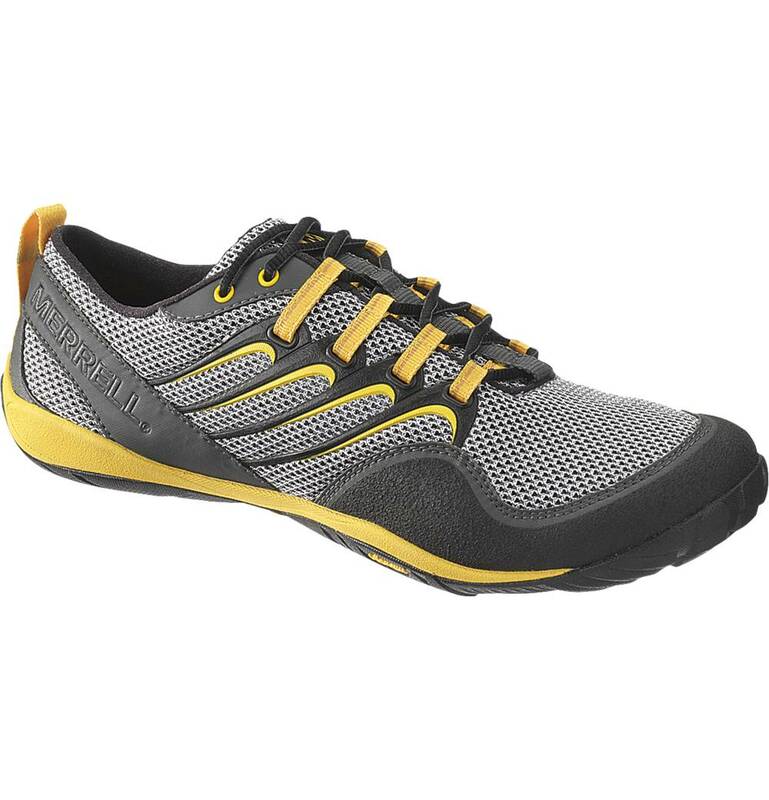 The barefoot shoes by Merrell seem more natural due to their lack of cushioning and I feel that if I can learn to run in these then I could run in anything, even Vibram Fivefingers. So on Saturday I decided to go and try on some Merrell shoes. I tried on two pairs. The Barefoot Run Bare Access and the Barefoot Run Trail Glove. The Trail Glove seemed to fit my foot better as it had more arch support. So £85 later I walked out of the shop with a new pair of trainers. They feel so different to any other pair of shoes. Your feet feel so free. I can't wait until I can start to run in these but I am not planning on starting running until after my two triathlons for this season. I just plan on wearing them over the next 10 weeks as much as possible to strengthen my feet. My new Barefoot trainers. Picture robbed of the Merrell website. The other thing I noticed on wearing these shoes was that the pain in my achilles tendon goes away. Weird. I really want to run in the shoes now but for once in my life I am going to have to be patient as I don't want to injure myself before either of my two triathlons. I will save my transition until the off season. On Sunday it was finally time to see whether I could run again. After much procrastinating in the morning (I think this was partly born by fear of pain) I went for a rulk around my neighbourhood. I took in some hills as well to keep me on my toes and stop me aggravating my problem tendon. Apart form the fact I was blowing out my ar$e at the end (it is amazing what two weeks of not running can do to you) there were no major problems. When I got back I decided to brick this with a bike ride. Given the weather was so good I decided to do this outside. I've even found a 20km route which starts and ends at my house. The time was ok but I was held up by roadworks and a persistent headwind along one road. I should really have biked more but had other tasks to do so stopped after one lap. There's not a lot else that I have to tell you. Remember you can sponsor me via Justgiving or by texting NSMK50 £2 to 70070. It only takes thirty seconds to send that text. Thanks for reading and I'll update you all over the week as to how I'm getting on now that I'm a running man again.